For a majority of people, getting braces is something they don’t necessarily look forward to. Sure, they’re eager to have straight teeth, but they aren’t super excited about having a shiny metal smile. The great news is, having braces can actually be a blast when you’re working with the right team. Additionally, you have a lot of options that don’t necessarily include metal brackets. That being said, metal brackets continue to be the most cost-effective option, and at Rogers & Andrews Orthodontics, we make having braces a blast. We not only make each of your visits exciting and fun, we work hard to make sure you know how to take care of your teeth and end up with results you love. If you’ve never had braces before, there will be a bit of a learning curve as you get used to your new orthodontic appliances. We’ll give you plenty of information that will smooth your path to straight teeth, making it as easy as possible to care for your braces. We understand that integrating new habits into your daily routine can be a bit stressful, so we want to use today’s blog to share four tips to keep at the top of your mind. Try to chew with your back teeth. The braces on your front teeth are the most vulnerable, especially if you’re used to taking big bites of food with them. We’re talking about eating corn on the cob, chicken wings, and other foods that require your front teeth to do a lot of work. While you have braces, cut foods like these into smaller pieces and chew them with your back teeth. This will help protect your braces and ensure your treatment moves along without being slowed down by broken brackets or loose wires. You’re getting braces to solve dental issues, not create them. However, if you fail to care for your teeth properly while the braces are on, you can end up with dental issues when they come off. 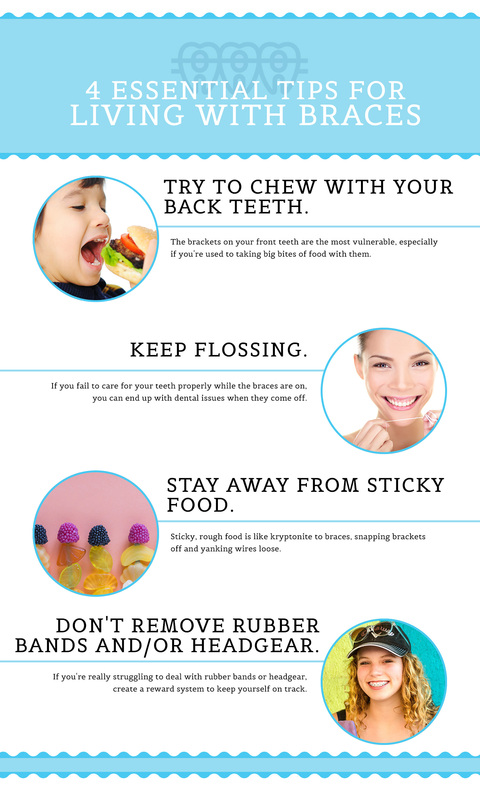 Flossing is a primary way to keep those issues at bay. Yes, flossing around braces can be a pain, but not nearly as bad as you may think. We have special floss threaders that make it easier to get the floss under the wires and in between brackets, and we’ll make sure you get what you need! Stay away from sticky food. We’re sure you’ve heard this one before and you might be tired of hearing it again! However, sticky, rough food is like kryptonite to braces, snapping brackets off and yanking wires loose. Though it may be a pain to avoid favorite foods like caramel, gum, and hard candy, it’s well worth it to keep your treatment on track. The more solid your brackets and wires remain, the sooner your treatment will be over. Don’t remove rubber bands and/or headgear. If you get annoyed with your orthodontic appliances, you aren’t alone. Many people struggle to be patient with the measures necessary to give them the straight teeth they want. However, if we’ve given you an appliance, it means that the appliance is necessary, and failing to keep it installed can greatly slow down your treatment. If you’re really struggling to deal with rubber bands or headgear, you can create a reward system to keep yourself on track. We will also encourage you and make our treatment as effective as possible. Getting braces leads to incredible results, including a healthy bite and a confident smile. Contact the team at Rogers & Andrews Orthodontics in Augusta and get the orthodontic treatment you need!